"The SLCD displays provide consumers with a comparable visual experience to HTC's current 3.7 inch displays with some additional benefits including battery performance." So, just how "comparable" is the SLCD? To find out, we picked up both flavors of the Desire to perform some comparison tests. Let's start off with the picture quality: what caught our attention straight away was how much sharper SLCD is, but alas, AMOLED is still in the lead for vibrancy and brightness. We dug a little deeper and learned that this has to do with the different pixel arrangements on the two types of panels -- unlike traditional TFT LCD panels, AMOLED's PenTile RGBG (red, green, blue, green, etc.) filter matrix utilizes just two subpixels per pixel instead of three in the same amount of space, thus allowing greater transmittance due to the larger red and blue subpixels. But obviously, the downside is that the pictures aren't as sharp as the denser-packed SLCD. Read on for more! Another noticeable difference is that this SLCD has a warmer tone and -- to our surprise -- better color definition than our AMOLED, even though the latter panel produces darker blacks (as the black pixels don't transmit any light at all). Both of these findings are presumably the side effects of AMOLED's larger red and blue subpixels (with blue ones being the largest of the three colors), and consequently, we get a more faithful color reproduction from SLCD. We then compared viewing angles and concluded that AMOLED and SLCD respectively owned the side-way test and vertical test, but the dead zones were so negligible that most people wouldn't notice them. Next up is the reflection test. In our Desire and Legend reviews we've moaned about how AMOLED screens look horribly washed out under daylight, so we were hoping that the SLCD Desire wouldn't suffer from the same flaw. However, the actual outcome was rather disappointing: with both screens boosted to maximum luminescence, the brighter AMOLED was actually a touch more visible than the SLCD, but still far from usable on a bright day. In fact, we've seen better outdoor performance on the Nokia N8's AMOLED screen, so it seems that HTC's glossy glass is to be blamed for the rather surprising test results here -- we've certainly seen the same problem plaguing our LCD-donning Hero as well. Anyway, you can see more outdoor ugliness in the video below. To draw an end to our comparison test, we decided to see if Chou is right about SLCD sipping less battery juice than AMOLED. To do this, we put both Froyo phones on airplane mode, disabled screen timeout, set the brightness to medium, made sure no extra services were running, and then let the same movie -- Four Lions, if you must know -- burn them off until they give up. Well, guess what? Chou might be wrong -- in our two runs, the SLCD Desire consistently died within a little under five hours, whereas its AMOLED brother was still going strong with about 30% battery left. And before you say it, we even swapped the batteries across the two phones before the second run, so it's safe to say that AMOLED is actually the more efficient hamster here. So here we have it: there really is no clear winner between SLCD and AMOLED when it comes to picture quality -- the former offers a sharper picture plus a more realistic color reproduction, whereas the latter shows off brighter, more vibrant colors. 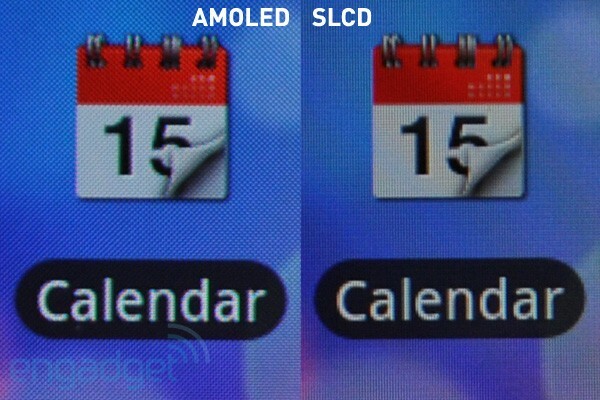 But as we concluded earlier, AMOLED seems to be slightly ahead of the game with its power efficiency. Still, this doesn't help the fact that both screen types suffer from the same glossy glass on the Desire, thus rendering them almost equally as useless under daylight. Come on now, HTC: whatever you're announcing this Wednesday, let's hope that you have something real special up your sleeves to please our eyes, literally.